A white egret wades through a shallow pond. Great egrets are graceful birds. In this piece, the brilliant white bird is contrasted by the rich deep hues of summer foliage. 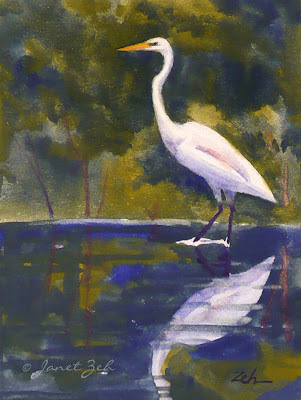 Great Egret print is available in multiple sizes and may be ordered framed, unframed or on canvas. Click the Order Print button below for sizes, options and prices.